Unless you enjoy being put in situations that will test your patience. This week I posted this image on my facebook profile because this quote has been running through my head. Johnny took the photo when we were in Los Cabos in January at Lovers Beach. All week I've been struggling with this concept of "happiness is a choice". 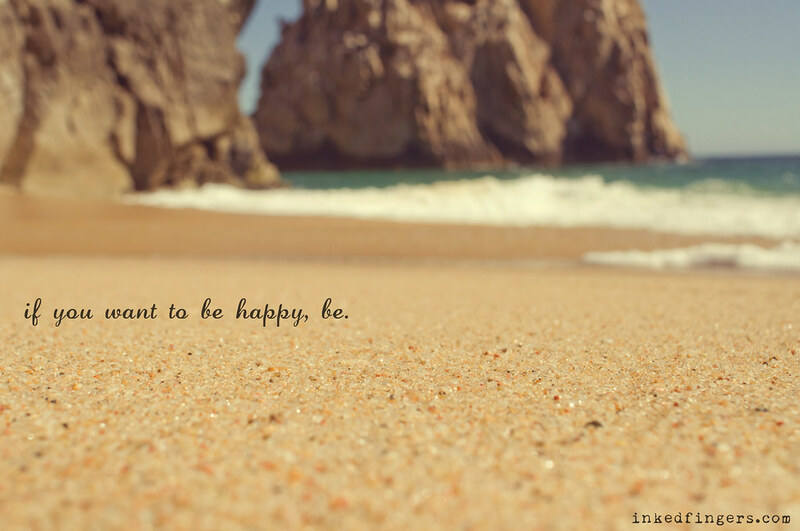 "Just choose to be happy!" I'd tell myself. "BUT I don't have this..." Or "I feel this way... WHY does this have to happen... I can't be happy unless..." You get it. So I prayed that I might choose happiness over a "victim mentality" and truthfully it's never been so difficult. Why?!?! This week, the woman I want to be chooses happiness. She finds joy in all things and overcomes this life-must-be-easy mentality. There are always two choices. Two paths to take. One is easy. And it's only reward is that it’s easy. you are so right <3. i needed to hear this today. thank you for always knowing just what to say :). "there is no way to happiness and peace. happiness and peace is the way." I enjoyed this so much. I pray daily for patience, especially when it comes to my kids, and I'm tested everyday. Sometimes I fail but I take a deep breath and try again. Also regarding choosing to be happy. I could have wrote those words. I have so much happiness in my family and everyday life but it's my photography business that has me bummed out. But I will just keep going after it until I reach my goal. Anyways, sorry for the long comment. Just wanted to say thanks.